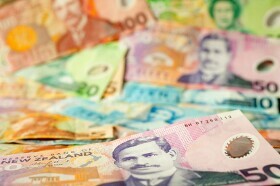 The New Zealand dollar was falling for the most part of the Wednesday’s session, rebounding for a short time after the US Federal Reserve turned out to be surprisingly dovish. Yet the kiwi jumped sharply by the end of the session after the release of New Zealand’s gross domestic product. Statistics New Zealand reported that GDP rose 0.6% in the December quarter from the previous three months following the 0.3% growth in the September quarter. The actual reading was in line with market expectations. Year-on-year, the economy grew 2.3%, missing the average forecast of a 2.5% growth. Looking deeper into the report, service industries, construction, household spending, and investment spending rose. But agriculture, forestry, and fishing industry contracted. Furthermore, real purchasing power of New Zealand’s income fell 0.2%. NZD/USD jumped from 0.6849 to 0.6911 as of 22:50 GMT today, rebounding from the daily low of 0.6826. EUR/NZD was at about 1.6519 following the earlier rally from 1.6561 to 1.6625. NZD/JPY opened at 76.31, dropped to the low of 75.89 intraday, but rebounded to 76.55 later.